With the 6th pick in the 2016 MLB first year player draft the Oakland Athletics selected A.J. Puk. 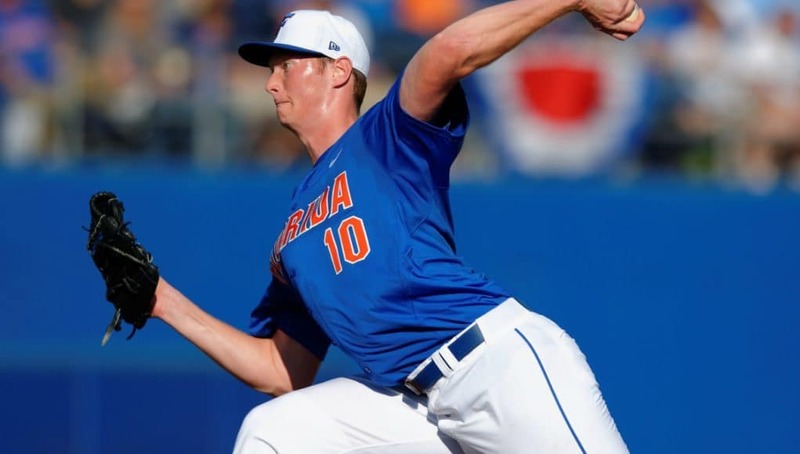 Puk has been one of the most tantalizing players in Florida Gator athletic history. Scouts drooled all over him coming out of high school. The 6’7”, 215 lb. frame, the easy 93 mph fastball, and oh, by the way he was a left-handed pitcher. For the big southpaw, it was all too easy to draw comparisons to Randy Johnson, the 6’10” left-handed hall of fame pitcher. Fast-forward 3 years and all of a sudden he is 230 pounds, and throwing anywhere from 94-98 mph. According the MLB Networks Jonathan Mayo “The Oakland A’s did not think there was any way that he would fall to them, they are probably doing cartwheels; He has future front end of the rotation stuff”. He was ranked the 23rd player coming out of high school in Cedar Rapids, Iowa. He was also a good hitter, and even managed to get 86 career at bats for the Gators. His future was always on the mound though. Kevin O’Sullivan helped develop those off speed pitches that so desperately needed to complete the full package. The command of all of his pitches come and goes still at times, but when he is on, look out because the strikeouts can mount up pretty quickly. He needs to better his command of all his pitches going forward and maybe clean up his delivery a tad. Puk can get out of rhythm and that is what causes a lot of his control issues. However, he has skills you cannot teach. His size and the speed of his fastball is something that is a rare combination that gives him the projectable talent at the next level. The statistic that is most eye popping and the one that probably really matters to a lot of scouts is that in 190 career innings pitched, he has 245 strikeouts. Again he has 245 strikeouts in 190 innings. This is astounding. This equates to roughly 1.3 strikeouts to innings pitched. However he has issued 84 base on balls (walks/hit by pitch), which is not a good number at all. This highlights his control issues, and his potential to be a star. To this date, his best season ERA was actually his freshman year at 3.19 in 20 appearances, which he went 5-2 on the year. Out of those 20, only 7 were games he started and most of them were midweek games. He was eased into the weekend rotation, unlike his counterpart Logan Shore, who was thrust into the Friday night role as a freshman. His sophomore year he sported a 3.81 ERA in 17 appearances (14 starts) and this season (before super regional play) he is at 3.21 in 15 appearances (15 starts). This season, which has been a slight disappointment due to all of the hype surrounding him, opponents are still only hitting .195 against him. The off field incident during his sophomore season which resulted in suspension for multiple games seems way behind him. 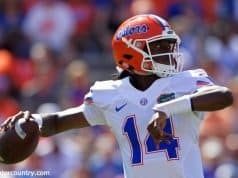 Gator fans realize he has the talent, but it is not always showing up when he shows up on the field. With a slot signing bonus of $4,069,200 there is about a zero chance he comes back for his senior season, and nor should he. He will instantly join last years first round pick and former Gator Richie Martin as one of their top prospects in their organization. There was hype that he could have been taken No.1 but falling to No. 6 is still a great accomplishment, and his ceiling is almost unlimited. Matt graduated from high school from Providence School in Jacksonville, Florida where he won a State Championship in baseball. 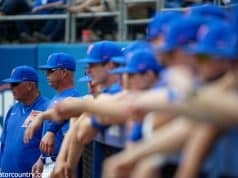 After two years of playing college baseball at Valdosta State University, he jumped at the chance to transfer and be accepted to his lifelong dream school, at the University of Florida where he is currently a Junior Business major. He is very passionate about all Gator sports with Football, Baseball and Basketball topping the list. Currently he serves as a practice player squad member for the Women's basketball team at UF. 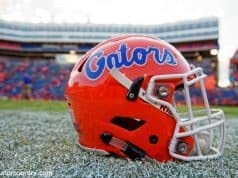 Favorite all time Gator is Danny Wuerffel.